Prasiolite (Green Quartz) - also MISnamed Green "Amethyst"
This material is super clean and extra large for cutting spectacular gems. 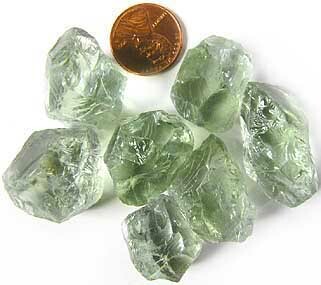 Representative sample of Prasiolite at $1.00/carat. 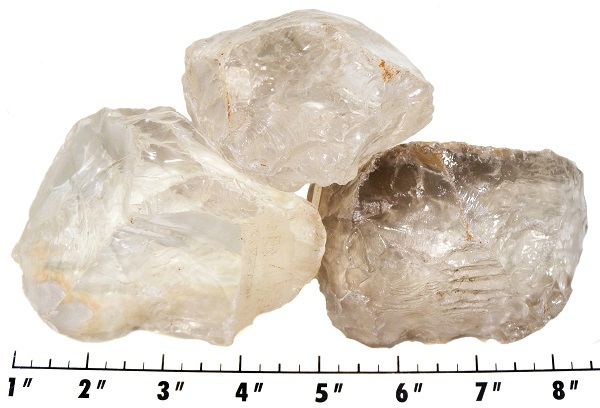 This material is heated and irradiated quartz. Measures approx. 32.0 x 16.5 x 8.5mm. Best yield is a long pear or a matched pair of trillions. Beautiful crystal point! Measures approx. 25.7 x 18.3 x 15.5.mm. Best yield is an oval. Measures approx. 24.0 x 18.0 x 17.5mm. Best yield is an oval or a fat pear. Best yield is a square cushion and a pear, or a pendeloque. Best yield is a round and a heart or one marquise. Best yield is a pear. Best yield is a trillion or heart. Measures approx. 28.0 x 18.0 x 14.0mm. Best yield is a pear. Best yield is a heart or round. Best yield is a large round plus a matched pair of trillions. Best yield is a round. Best yield is a pendeloque or briolette. 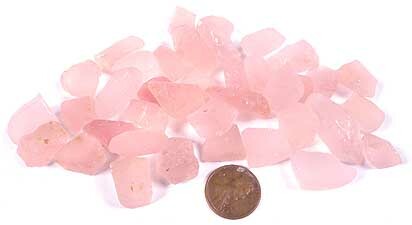 Representative sample of Rose Quartz at $0.55/carat. This Rose Quartz has been sliced and ground in to clean pieces. Any flaws are near the surface where they will be removed during the faceting process (other than the standard sleepy nature of rose quartz). 2-piece parcel measures approx. 18.2 x 11.8 x 7.2mm, and 20.6 x 10.6 x 8.0mm. 2-piece parcel measures approx. 14.8 x 9.5 x 7.9mm, and 14.1 x 10.8 x 8.4mm. 2-piece parcel measures approx. 19.2 x 10.3 x 8.7mm, and 14.5 x 12.7 x 7.1mm. 2-piece parcel measures approx. 20.3 x 10.6 x 7.5mm and 14.4 x 9.4 x 8.4mm. 2-piece parcel measures approx. 15.2 x 13.7 x 11.8mm, and 14.4 x 10.1 x 8.1mm. 2-piece parcel measures approx. 13.3 x 8.2 x 7.1mm, and 15.4 x 8.8 x 7.9mm. 2-piece parcel measures approx. 18.6 x 10.6 x 8.4mm, and 10.5 x 10.5 x 6.7mm. 2-piece parcel measures approx. 16.1 x 8.3 x 9mm, and 12 x 10.2 x 8.2mm. 2-piece parcel measures approx. 11.9 x 9.1 5mm, and 15.1 x 11.8 x 6.5mm. 2-piece parcel measures approx. 15.3 x 10.4 x 8.3mm, and 12.5 x 8.2 x 7.0mm. 3-piece parcel measures approx. 12.2 x 9.5 x 8.1mm, 9.7 x 7.8 x 7.1mm, and 11.0 x 9.0 x 5.7mm. 2-piece parcel measures approx. 17.3 x 13.3 x 6.2mm, 16.7 x 11.6 x 5.4mm. 2-piece parcel measures approx. 14.0 x 11.9 x 11.7mm, and 13.7 x 8.3 x 7.5mm. 2-piece parcel measures approx. 14.4 x 7.6 x 7.4mm, and 11.4 x 9.9 x 9.4mm. 2-piece parcel measures approx. 15 x 11.6 x 7.8mm, and 9.7 x 8.9 x 7.1mm. Representative sample of Optical Quartz at $79.50/kg. 3" x 2-1/4" x 1-3/4"
4" x 3" x 1-3/4"
3" x 2-1/4" x 2-3/4"
3-1/16" x 2-1/2" x 1-3/4 to 1-1/4" thick. 3-3/4" x 2-1/4" x 2 to 1-1/2" thick. 2-3/4" x 2-3/4" x 2"
3" x 1-3/4" x 2 to 1-1/4" thick. 4" x 2-1/4" x 2-1/2"
3-1/2" x 3" x 2-1/2"
3-1/2" x 2-1/2" x 2"